Tamarindo Beach .5 mi, Hacienda Pinilla Golf Course - 2.2 mi, Grande Beach - 3.4 mi, Avellana Beach - 4.2 mi, Parque Nacional Marino Las Baulas de Guanacaste - 4.5 mi, Conchal Beach - 8.5 mi, Santa Cruz - 3 mi. Cala Luna is steps from Langosta Beach, adjacent to Tamarindo Beach which is Central America's mecca for surfing. Offshore sport fishing (sailfish, marlin & other prized species) is highly recommended. Exceptional scuba dive sites dot the stretch of Pacific coastline and several PADI dive shops service the property. Easy-to-access daily activities are 18-hole golf, tennis, horseback riding, canopy tour, bird watching and nature trails. 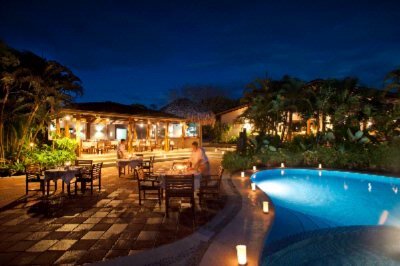 Located in Guanacaste, Tamarindo's beach district has Cala Luna, the most celebrated boutique hotel in a secluded setting. With picturesque architecture of indigenous hardwoods, this stunning property blends with its lush surroundings. Accommodations are fashioned in sophisticated comforts, and range from Deluxe Rooms to Villas expansive enough to sleep 6. Each Villa in distinguished décor has a private pool, tranquil terraced garden and sleek gourmand's kitchen. Classic amenities for families to indulge are the hotel's very own surf school and free-form pool with cabanas. An organic garden is applauded for its abundance and care. After dark, this region's most admired fusion dishes (International and seafood) are created by Cala Moresca. Evoking “eco-chic” elegance, all 41 villas and rooms are true havens of tranquility, appointed with every conceivable amenity. Just steps to famed Pacific sunsets on Langosta Beach, each is carefully designed for family or romantic escapes, appealing to discerning travelers. Cancellations made within 14 days of arrival are subject to 50% loss. For cancellations within 60 days of arrival during the Festive Season(Dec 20 to Jan 4) 100% loss applies. Daniel Oduber Quirós International Airport; Liberia Airport (LIR) – 1 hour 37 miles (60 kms) and Tamarindo Airport (TNO) – 10 minutes 2 miles (3 kms). Local Shuttle Info: Shuttle to Liberia Airport (LIR) cost is $40 one-way for 2 persons. Below are the meeting, banquet, conference and event spaces at Cala Luna Boutique Hotel & Villas. Feel free to use the Cala Luna Boutique Hotel & Villas meeting space capacities chart below to help in your event planning. Hotel Planner specializes in Tamarindo event planning for sleeping rooms and meeting space for corporate events, weddings, parties, conventions, negotiated rates and trade shows. 1000 x 200 x 0 Ft.
$500 savings discount entitled to events with a total spend over $5,000 on food and beverage.